Since adding the vintage Hungarian posters, the kitchen is a fun place to be. They are HUGE and (fashionably) fill up the whole wall with saturated colour. I love the statement they make against our relatively plain kitchen. 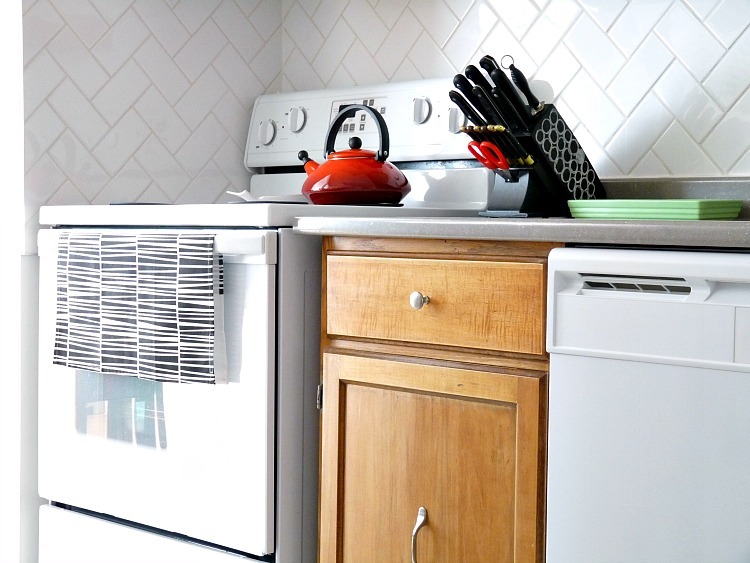 Although there are elements of the kitchen I love (the herringbone tile backsplash we installed, the teak chairs we re-upholstered with houndstooth fabric, the funky black and white floor), if you’ve been reading for awhile you know there’s lots I don’t love (the wood cabinets Hubby loves, that we refinished, but still aren’t my cup of tea, the awkward layout, the windowlessness). But now I’m at peace with the whole package and am committed to this art (as opposed to version one and version two). 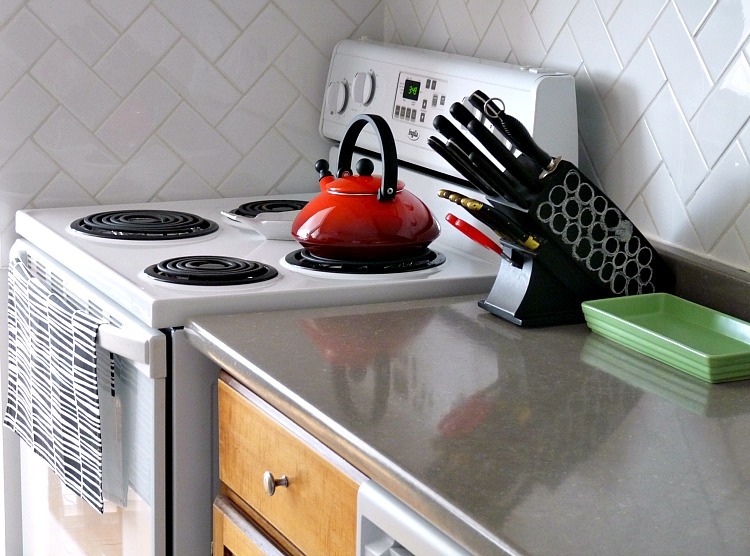 In no particular rush, I am finally accessorizing the kitchen with a direction, using the posters as my guide. When I can, I like to pick art for a room first, and then pull inspiration for colours and textures from it. My new (to me) FAB trays look fun in the space, especially because the retro fabrics really bring to life the vintage attire sold in the posters. I’m using one to corral the hand soap and dishwasher pods I like to keep at arm’s length (I’m officially too lazy to bend over and retrieve the pods from the cupboard under the sink). The horn dish is from Hungary. I also have a beautiful new tea towel, sent all the way from Berlin! 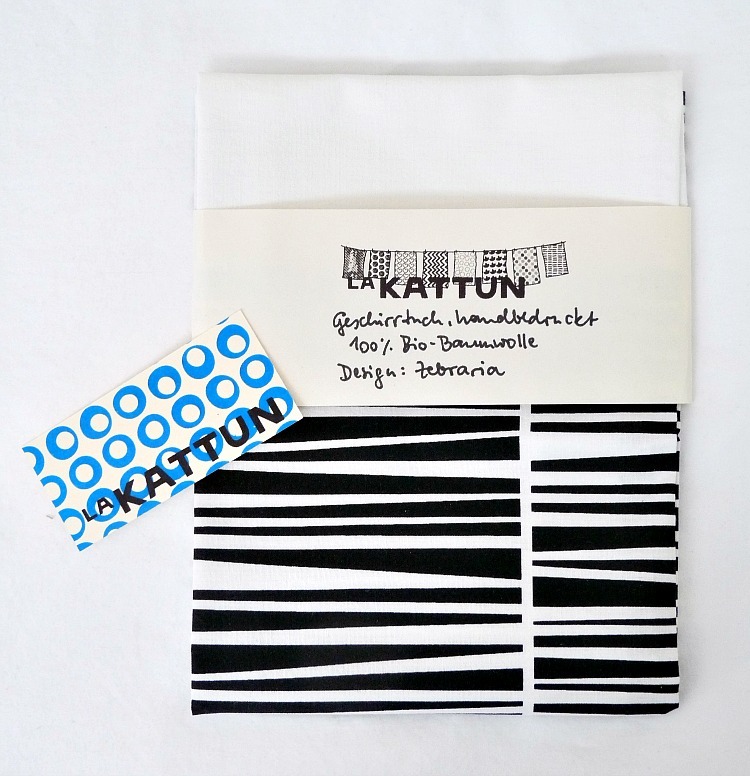 This graphic black and white (Zebraria) tea towel is from La Kattun, handprinted fabrics. It’s hand-printed on organic cotton by a Berlin-based artist, Eva Reisinger. I’m in love with her fresh and modern designs (available in her etsy shop). I knew this crisp pattern would look perfect with my punchy posters (especially the one with striped parcels), and black and white floor! She has also makes pillows with the same design and I am smitten with those too. Next up: MORE COLOUR! But summer is coming and with it, yard sale season!! 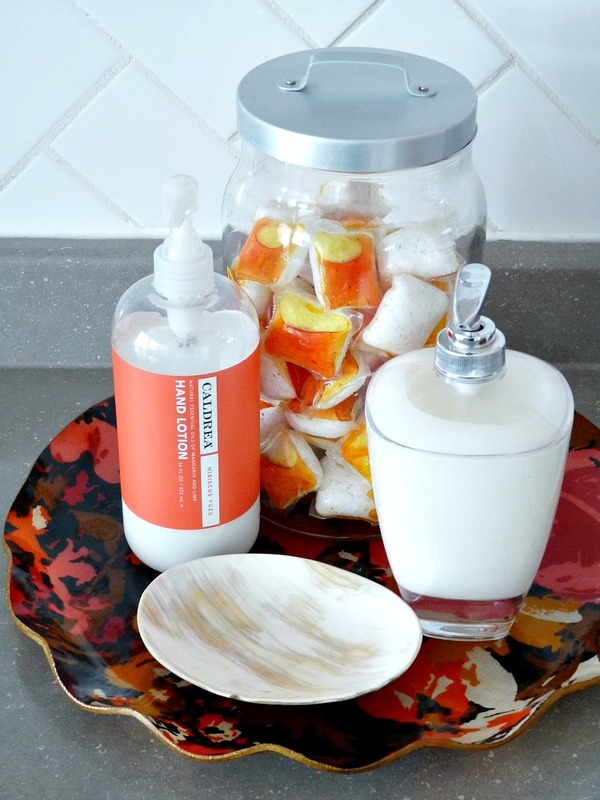 I know I’ll find some great accessories, for a great price, if I’m patient (my Krenit bowl was last year’s sweet kitchen find). Our counters do get a daily dose of colour courtesy of my growing Pyrex, Anchor Hocking and Federal Glass collections, which we use for fruits and snacks every day. P.S. Eva is thrilled that I’m so enamored with her hand-printed textiles, so she’s offered to host a giveaway for Dans le Townhouse readers! She has sewn something gorgeous, just for you, so stay tuned next week for details on how to win. I also asked Eva a few questions, so we can snoop inside her design process as well. 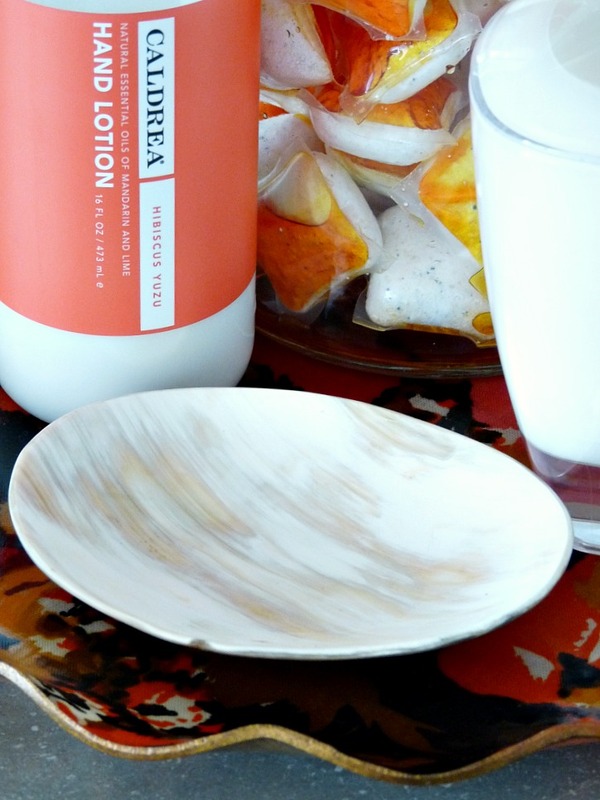 If you can’t wait, take a look at her lovely blog, peek inside her studio, or check out her etsy shop, La Kattun. 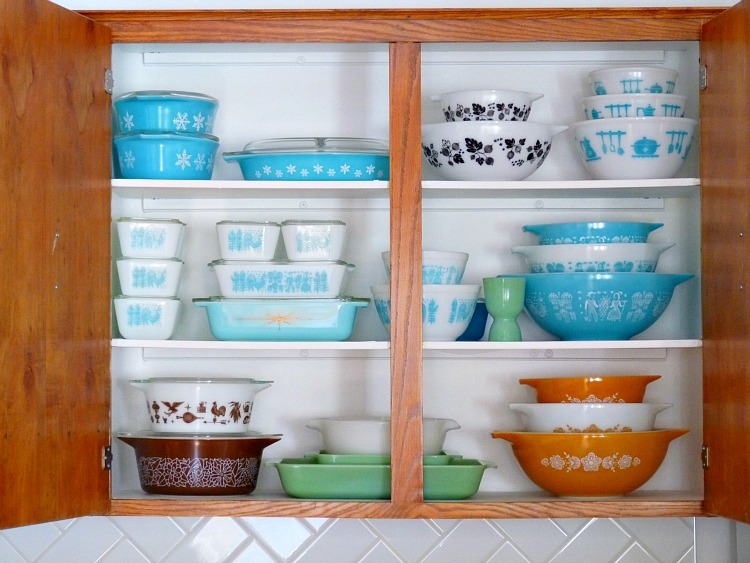 That Pyrex cupboard is GORGEOUS! I vote take the doors off! Haha, thanks! You know, I really was tempted when we were refinishing them to leave some off. But the construction of the cupboards is just not nice enough. Right now I'm hoarding it but one day I will have beautiful glass fronted cabinet filled with Pyrex! Townhouse living 😉 There is an opening, plus a doorway, to the right of the posters that leads to the dining room and its big window. That's where most of our light comes from, so some days it is a bit dark in the kitchen. I can't wait to have a detached home. I cannot wait! Haha! The brown casseroles (bottom left) and yellow nested bowls (bottom right) plus one random butterprint cinderella (a double, but it's holding lemons in the fridge) were all one big score recently. So I won't be finding any for awhile. That's how it goes, lol! Personally, I like the wood cabinets! 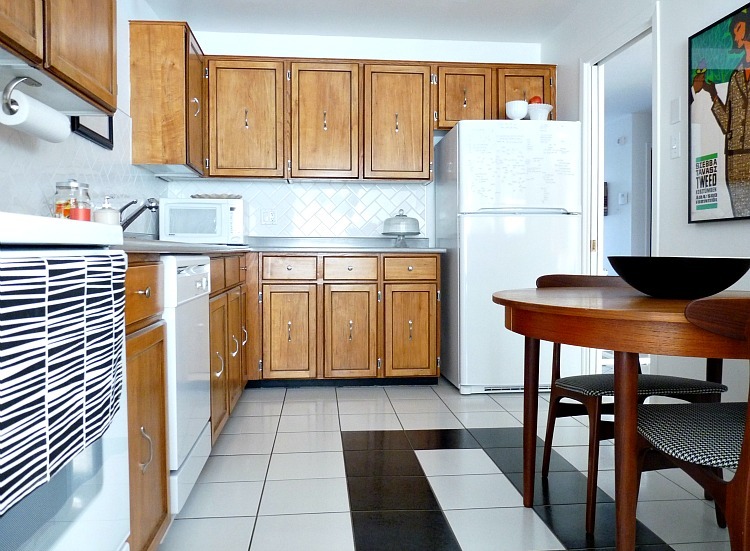 We have white cabinets in our apartment but I've gotten the chance to peek into other units with unpainted (wood veneer) cabinets and they just seem so much homier 🙂 Wow! I'm in awe of your pyrex collection. The pattern on the middle shelf is one of many I'm drawn to… I have two tiny refrigerator dishes and would like to collect a few more. Also, thanks to you, I'm now constantly being drawn to Figgjo wares, which I first discovered in your Etsy store. Now it's just a matter of deciding what piece to buy first! The posters look fabulous, and I love that tea towel. Isn't the tea towel perfect? I have so few things in the kitchen, I like each one to be perfect and I think the black and white stripes are just right! Plus, I love that Eva works out of Berlin. My Hungarian posters have a European friend now, lol. I live in Clarksburg, WV. When I was growing up, we had a huge Anchor Hocking Company right here! It employed a lot of our citizens, and then in the 80's it closed down. Lots of people out of work, including some of my friend's parents. A few years later there was a huge fire and it burned to the ground. The ruins are still sitting there. Just thought you might be interested in that little tid bit. Oh gosh, that is neat but so sad. I'm sorry to hear your parent's friends lost their jobs. That's always so hard for a city when a major employer shuts down! Oh my gosh, I love the impact the posters made in your space!! What a great shot with your table and chairs. Great casserole dish, etc, collection, too! Thanks!! They are such a sweet reminder of my trip, I'm so happy I found them! 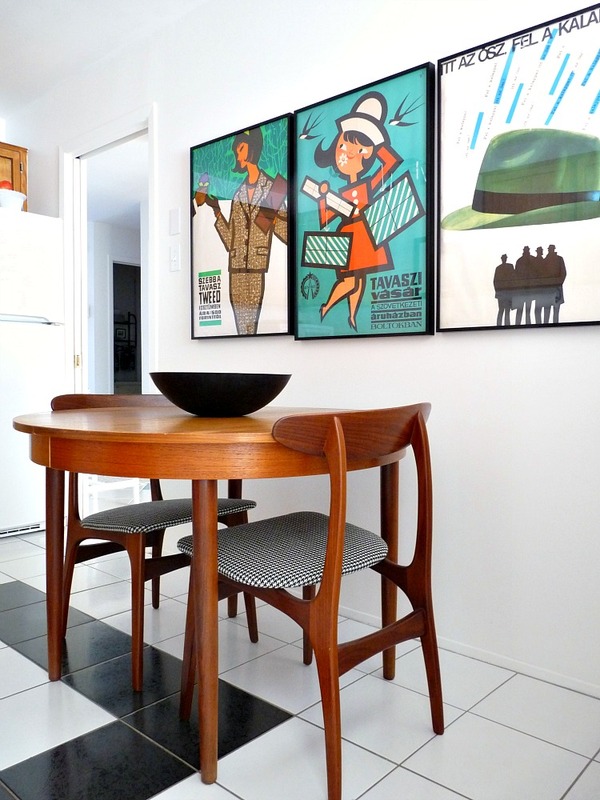 Love the kitchen- the posters make such a huge impact.and the tea towels are beautiful- I love graphic linens. oh and I love you fridge magnets- I need to get a set (not just for the kids). Where do you get those? Chapters, maybe?I made some 'love letters' using glass pebbles & mini magnets to leave messages for my hubby (pinspired by a diy dry-erase photo frame with "I love you because…. ___________") I let my guy know every week or so another reason I love him- sometimes it's funny and sometimes sappy but it's fun. However, my kids are always stealing the letters to spell something on the lower door of the fridge. These word magnets are a fun way to foster creative writing skills. 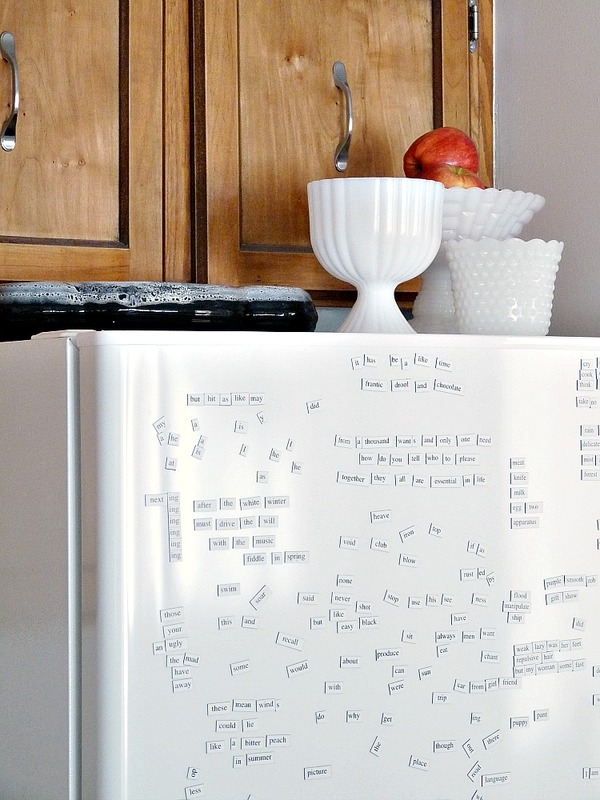 Are those magnets on the refrigerator? Cool idea. Did you make them? I am tempted to have something like that for my kitchen. Would be fun!